Nannorrhops ritchiana, the Mazari palm, one of the very hardiest palms in the world was, until recently, also one of the rarest in cultivation. Finally, after several years of work, literally hundreds of faxes and phone calls, and not least of all, a trip to Pakistan (not our favourite holiday destination), we located what we hope will be a regular source of seeds of this tough and attractive palm. Its high altitude desert origin in Northern Pakistan and Afghanistan (to about 1700m/5600ft a.s.l.) gives an indication of its requirements viz: hot, dry, and bright. 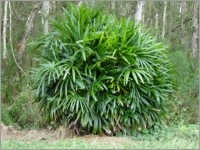 Mature Nannorrhops ritchiana are sucessfully culivated in such diverse places as Florida, California, Texas, Italy, France, and Venezuela, indicating that it will thrive in temperate areas just as well as in the cooler tropics. In winter, if kept dry, it may resist temperatures as low as -20°C (-4°F). With summer heat it is relatively fast growing, and will develop into a large shrub with several short, erect trunks and very thick, blue-green, leathery fan-shaped leaves. 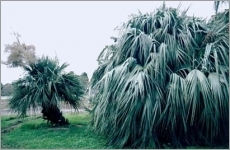 It is a palm which surely everyone will want to have in their collections.